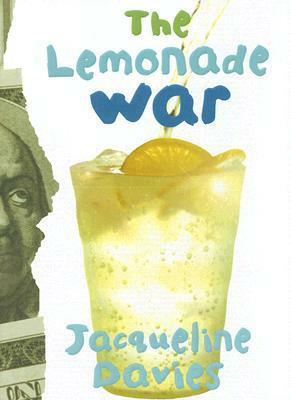 The Lemonade War by Jacqueline Davies. Grades 2-5. Houghton Mifflin Harcourt Books for Young Readers, 2007. 192 pages. Review copy provided by my local library. Incoming fourth grader Evan Krenski can't believe the news he's gotten. His egghead little sister (whom he's gotten along with until she ruined his life) will be skipping a grade and joining him in the fourth grade this year. Now everyone in the class will see how stupid Evan is, worse at math than his baby sister. Evan's. Life. Is. Over. Jessie is overjoyed to be in Evan's class this year. Maybe he can help her make some friends. Maybe he can get the other kids to stop being mean to her. But first he has to stop being mean to her. Jessie's not sure why he's suddenly so mad... and it hurts that he won't even speak to her for these last few days of summer they have left. And then an argument leads to The Lemonade War. Evan vs. Jessie in a contest to see who can earn the most money from their lemonade stands. Winner takes all. There will be underselling, yes. There will be betrayal, in fact. All's fair in love and war... and lemonade? For the past several years, one of our local banks has sponsored a financial literacy program which we run as part of our Summer Reading Club. Any child who reads a book about money, business, financial matters, etc. can enter a drawing for a prize donated by the bank (it's been a $50 savings bond, although this year it's a $25 gift card). It's always a scramble to find enough money books to satisfy demand, and The Lemonade War is one that I've always put on the list. It was time to read it. What I found is a book that's not only a sweet and interesting sibling story, but a great, accessible way to introduce basic business principles. As Evan and Jessie work and rework their lemonade stands, they talk about principles like profit margin, value added, and underselling. It's all done in a kid-friendly way that doesn't detract from the story. This would make for a GREAT readaloud, especially as part of a unit on financial literacy, but it's also a book kids are likely to pick up on their own. For more chapter books featuring kids and their money-making ideas, try Lunch Money by Andrew Clements or In Business with Mallory by Laurie Friedman. For kids who liked the late-summer setting and the solid, realistic setting, I might suggest Moxy Maxwell Does Not Love Stuart Little by Peggy Gifford. Moxy is just as creative as Evan or Jessie, even if she might be a little quirkier. Readers looking for their next contemporary chapter book might also like other books by Andrew Clements, Sara Pennypacker, or Lenore Look. I might also suggest The Fabled Fourth Graders of Aesop Elementary by Candace Fleming. The Lemonade War is on shelves now! Fantastic Friday: How's It Going? Reading Wildly: How's It Going?